Set potherbs to boil with a potherb soup, whether they are cut or chopped, and add whole pepper and mace to it, let it boil with that and when you want to serve it, take toasted slices of white bread or rye bread, enrich it with hot butter and strew ginger on it. The text and translation of the recipe can be found in Volker Bach’s excellent collection of medieval period recipes that can be cooked in a camp setting, Plain Fare, which is available for download here. “Pot herbs,” or leafy green vegetables, were staples of the medieval diet for all classes of people. 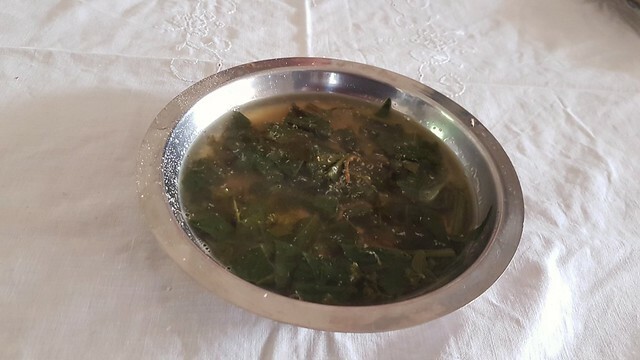 However, green leaf soups for noble households invariably included costly spices, which made them very different to the soups that would have been served in a peasant household. Finely shred the cabbage, chard and parsley. Bring the vegetable stock to the boil, then add the vegetables, pepper, mace and salt. Cook until the leaves are soft. This will only take around a minute. Mix through the butter, and sprinkle with the ginger, just before serving. If desired, serve with toasted white or rye bread. Do not cook the vegetables for long – otherwise they will go bitter and be unpleasant to eat. The leafy vegetables I have used are suggestions only. You could use any other herbs such as chervil or coriander, or spinach in place of the cabbage or chard. You could even use kale, though I honestly don’t know why you’d bother. You can find a C14 English recipe for a potherb soup here. This entry was posted in C16 German, Recipes and tagged good recipe for beginners, vegetables.